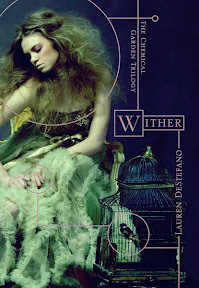 Wither [Book Review] – my books. my life. Medical science grew so advanced in the 21st century that it created a generation of perfect human beings. All of the big diseases and cancers are gone and no one really knows how long this generation will live. However, the descendants of this generation are not so lucky. At the age of 25 for males and 20 for females every single person contracts an illness and dies. Facing the possible extinction of the human race, things have grown quite uncivilized. Rhine, 16, is kidnapped when she applies for a job in NYC and taken to Florida where she is forced to marry Linden. There she lives with him; his father, Housemaster Vaughn; her sister wives, Jenna and Cecily; and a multitude of staff, including Gabriel, who Rhine quickly befriends. Rhine plans on escaping and finding her twin brother before it is too late. I must confess that I went into Wither with a bit of a critical eye. Because we had all received it at the same time, Jen, Michelle, and I were all reading it the weekend they visited. They were ahead of me and unlike almost every other person I had heard discuss it on twitter, they had found some faults with it. So I think I was a little biased. That said, my only real problem with Wither was that I thought there was something lacking and inconsistent in the world-building, and this can be remedied in the final books of the trilogy. I think the first book in a series is always difficult but especially so in a dystopian book. You have to get the plot going so you don’t lose the reader but you also have to set up the entire series. I guess I wanted a little more set-up in this one. The idea is so intriguing that I really wanted to know all of the details. The story itself dealt a lot with the way Rhine adjusted to her new life. She finds the situation is not as horrible as she thought it would be and even finds some sympathy for Linden. She wants to go home to her brother but she could probably get comfortable in the Florida mansion if it weren’t for the little horrors that sneak in (most of which concern Housemaster Vaughn and his desire to find the cure using any means available to him). Jenna and Cecily provide a nice contrast to Rhine. Cecily is so young (only 13!) that it is a little heartbreaking to see her get so excited about marriage and pregnancy. Jenna is older, closer to death, and accepts this as the best way to live our her final years. And then, of course, we have the love interest, Gabriel. Rhine and Gabriel can only sneak moments, so this is not a time-consuming romance. I really liked Gabriel but I wish there was a little more substance to it. My hope is that the rest of the series provides me with the things I felt were missing. I am certainly curious about the world and the characters and I will definitely read the next installment. I have this book on my shelf, and I am looking forward to reading it. I don’t usually do a lot of YA dystopians, but Lenore has gotten me excited about the genre as a whole, and I am eager to see what I think of it. I am hoping also that the world building is decent, because that’s the point I tend to focus on the most in dystopians. Great review on this one. I hope that the series does live up to your expectations! I agree – there was something lacking in the worldbuilding. I didn’t love this book, but I definitely liked it and am looking forward to the next one! I loved this one. I didn’t find the world building an issue mainly because I found it to be primarily character driven. It was far more situationally focused. The world they lived in does obviously play a role but it felt right to me that it was downplayed because the world Rhine was living in really was that house. I’ll be interested to see what comes as a result of the end of this book. Book two will have to delve more into the external. I knoe that your not suppose to judge a book by it’s cover but i am guilty of judging books by there cover. I picked it up and read the summary and loved the summary. I decided to begin reading it in the store to see if i liked it before I purchased it. So i plopped down into a chair in the starbucks i began reading and was immeaditly hooked. But then I realized I must get going so I decided to buy it. And I have not regretted it since then.